Mathematics is a fascinating and beautiful subject that offers a wealth of captivating intellectual challenges as well as valuable opportunities. It promotes the development of powerful analytic skills and it opens up an enormous number of career options. For these reasons, pursuing mathematics is a smart choice for you. 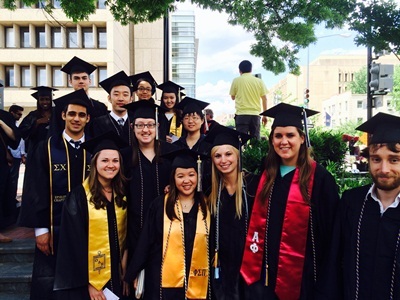 You have many options for studying mathematics at GW. You can be a mathematics major. You can do a double major. Your second major can be any area at all. It could be a technical field (such as physics, economics, engineering, computer science, or biology), in which case the two subjects enhance each other. It could also be an unrelated field that simply expands your horizons. You can be a mathematics minor. Whichever path best fits your plans and goals, you are welcome in our department. We invite and encourage you to discuss your academic and career goals with our advisors, who can help you plan a program of study in mathematics that best matches your interests. As a mathematics major or minor, you can choose from a wide selection of courses, including abstract algebra, real and complex analysis, topology, logic, set theory, combinatorics, number theory, differential equations, differential geometry, numerical analysis, financial mathematics, and mathematical modeling. Advanced undergraduates may choose to extend the range of options by taking independent studies and graduate classes. To offer you more options, the undergraduate mathematics major has three concentrations: pure, applied, and Interdisciplinary. The three concentrations differ in their emphasis, but all are designed to give you a solid background in the theory and practice of modern mathematics. In each concentration, you can choose either a Bachelor of Arts (BA), which requires 39 credit hours of approved coursework, or a Bachelor of Science (BS), which requires 45 credit hours. Those who may want to pursue graduate study in mathematics would be best served by the more theoretical focus in the pure and applied concentrations, and by the greater coursework in the BS option. The interdisciplinary concentration is intended primarily for those who wish to enter the job market immediately after graduation; it provides preparation for careers as mathematicians in government and industrial settings where mathematical modeling and computation play a large role. In each concentration, the BA option makes it easier for some students to complete the required courses in a second major or to pursue several minors. Almost every branch of government employs mathematicians in various capacities, including Department of Health and Human Services, Department of Energy, Department of Defense, and National Security Agency.